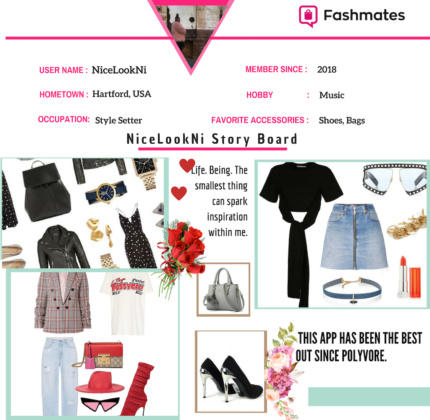 Meet NiceLookNi, Fashmates Brand Ambassador and Member of the week! NiceLookNi is active in our community, loves making sets and creating and is an absolutely wonderful person overall. Each week we will introduce you to a few of our awesome ambassadors, as part of our Meet Your Ambassador series! I was born and raised in the small city of Hartford, CT. I was always taught to appreciate and find the beauty in the smallest of things. My mother always taught me how to make something out of nothing. I was enrolled in a charter school and wore a uniform- I always had what I needed but not always what I wanted so my love for fashion grew at home. I would spend hours putting countless looks together surrounding a certain item. I grew to love collages and vision boards from my favorite magazines. That turned into after school classes, sketches, sewing and that spilled over into art. Art is what intensified my creativity and has been the main force for where I am now. I have now Become a licensed cosmetologist, working full time as a Stylist and taking fashion design and marketing classes. These days I am a proudly working on expanding my business as a Stylist and Image Consultant offering my services to both men and women. What brought you to Fashmates? While in school I was introduced to Polyvore and had to create sets as a part of my class assignments so I was originally part of that community. One day I went into the app and was just as surprised as many others when I was redirected. After that I tried many apps and sites before landing on Fashmates. I tried each app for about a week, some not even making it past a couple days. Yet Fashmates I was instantly addicted to! It felt familiar despite the areas that needed work which have since been worked on. I’ve been here ever since. What do you love about Fashmates? Right now I would have to say what I love most about Fashmates is the StylePoll. It’s very interactive, fun and leads me to some great profiles and items lol. My inspiration comes from art, music, magazines, movies… anything creative you name it. I am also inspired by life, feelings and just being. Why do you want to be a Fashmates Ambassador? Crossing over from such a large community on Polyvore and seeing the potential and promise that Fashmates has- I would love to be apart of the growth! I believe that Fashmates is moving steadily in the right direction working hard to create an atmosphere that most of us have grown to love and become accustomed to. I am so excited to tell anyone who I know is searching for something similar to PV all about Fashmates. When the opportunity to become an ambassador arose I knew it was my chance to become apart of something great! If you are interested in our ambassador program send us an email at community@fashmates.com! We can’t wait to hear from you!